The Napa Valley Wine Train promotes the responsible consumption of alcohol. No one under 21 will be allowed to consume alcohol. Our servers are trained to assist the customer and may refuse to continue to serve alcohol at their discretion. The Napa Valley Wine Train always reserves the right to withhold service to anyone at anytime. For the comfort and safety of all our guests, we reserve the right to relocate or remove anyone that, in our sole opinion, is creating a disturbance within any of the Napa Valley Wine Train’s offerings. The Napa Valley Wine Train reserves the right to change train schedules for any reason at any time. In the event that a schedule change affects our customers, we will make an attempt to notify the customer of the schedule change. The Napa Valley Wine Train also reserves the right to change our prices at any time. All reservations must be pre-paid with credit card or gift certificate numbers. We require a credit card to secure a reservation, regardless of whether the reservation is made online or over the phone. 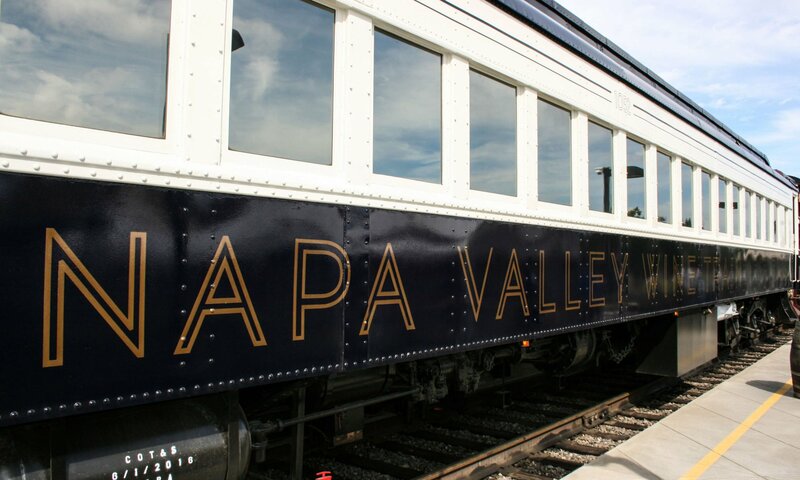 The Napa Valley Wine Train will charge the card provided as soon as we receive the reservation and have confirmed that space is available. It may take up to 24 hours for this charge to reach your account. 72-hour advance cancellation notice is required to avoid forfeiture of payment. 5 to 15-day cancellation notice may apply for some special events, holidays and larger parties. Delayed and “No show” guests who do not call will not be entitled to a refund, so please remember to call if you are delayed. Reserved Seats are released for resale 10 minutes prior to departure. In the spirit of traditional rail seating, you may share a table with another party on our Winery Trips, special events, and select packages during our lunch trains. A limited number of private upgrades are available in the Gourmet Express Package, and all tables are private in the Vista Dome. Parties of four will always be seated at the same table. To preserve the romance of the Napa Valley night, all parties enjoy private tables on our dinner trains. Please call a reservations agent if your party includes children age 12 or under in order to secure the children’s rate. Some cars and events DO NOT have a children’s rate. 0 to 12 month old children are not charged for a seat with Gourmet lunch, but they do have to stay on someone’s lap. No car seats, or strollers are allowed on the train. Some booster seats are available for children 1 years old and up. There are no changing tables on the train, and bathrooms are very small. There is a changing table in the station, but train rides are typically three hours or more. We understand the importance of receiving a Gift Certificate on time before the holidays. Please be aware that after December 20th the United States Postal Service cannot guarantee delivery of First-Class Mail, our standard method of shipping Gift Certificates, before December 25th. Starting December 20th, the Napa Valley Wine Train will begin issuing printable Gift Certificate replicas, which can be downloaded and printed so that the buyer can offer a physical object in place of a purchased Gift Certificate in the event that the Gift Certificate has not yet arrived. Be aware that this printed replica is not an actual Gift Certificate and that your Gift Certificate will arrive by mail shortly. If you require expidited shipping of the actual Gift Certificate, or have any other special requests regarding the presentation or delivery of your Gift Certificate, please call our reservations department at +1.888.721.8916. There are some important aspects of our online reservations process you need to be aware of. Online availability and actual availability may vary. We can not guarantee that the availability displayed online equals our actual current availability. We hope that you understand, and apologize if this causes you an inconvenience. We only charge your credit card if there actually is space on the day you requested a reservation. If there is no availability for the package you requested, we will try to get in touch with you to see about changing your reservation to a package with availability, but we will not charge your credit card until your reservation is confirmed by us. If there is availability for the package requested, we will take payment for the package within 24 hours of booking. We require a full deposit in order to make reservations. You will receive an email stating that your reservation request has been received. If we are able to make reservations for you, we will send out a second email confirming the reservation. If you wish to make any changes to your online reservation, please call us at +1.707.253.2111 or email us at [email protected]. If you can’t decide which day you plan on coming, please do not make multiple reservations for multiple days to hold out space. It will have the opposite effect. If we see that you have made multiple reservations we will assume it was an accident and will not process any of them until we are able to contact you. If you can’t decide which day to come, please call us and we will be happy to help you!